There's not a graham cracker or cookie to be found in this creamy carb-counter cheesecake's crust. Find out the secret here! Preheat oven to 325°F if using a silver 9-inch springform pan (or to 300°F if using a dark nonstick 9-inch springform pan). Spray bottom of pan with cooking spray. Sprinkle evenly with almonds. Beat Neufchatel, cream cheese, sugar, sugar substitute and vanilla in large bowl with electric mixer on medium speed until well blended. Add sour cream; mix well. Add eggs, 1 at a time, mixing on low speed after each addition just until blended. Pour into prepared pan. 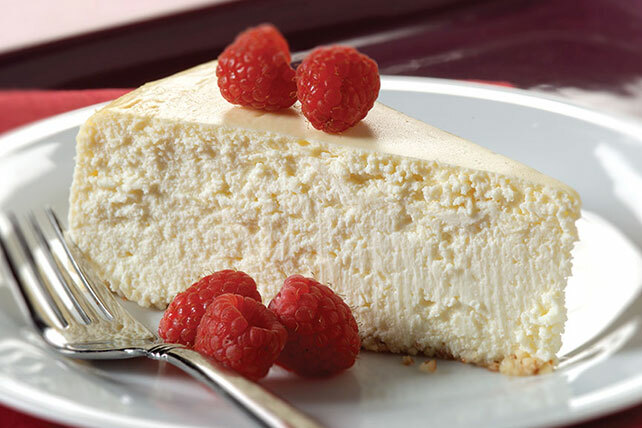 This cheesecake contains 12g total carbohydrate and 300 calories per serving while the traditional PHILADELPHIA® Classic New York Style Cheesecake contains 24g carbohydrate and 400 calories per serving.